The AIRC has led field school excavations from 2003-present with impressive results. Students learn archaeology, field methods, and actively study and document finds from seasons 2012-2016 with seasoned experts in a fun, enjoyable environment while living in Rome. The AIRC Summer Archaeological Field School-Study Session offers its participants both a synchronic (single-period) and a diachronic (multi-period) approach to the study of Roman culture. Through this dual approach, which provides depth and breadth simultaneously, participants will gain a comprehensive historical and cultural appreciation of Rome and Roman civilization, from its rise to power to its decline, understanding how it set a standard of cultural values that continues to exert influence over the entire Western world to this day. be introduced to the principles of conservation of the material remains of the past. 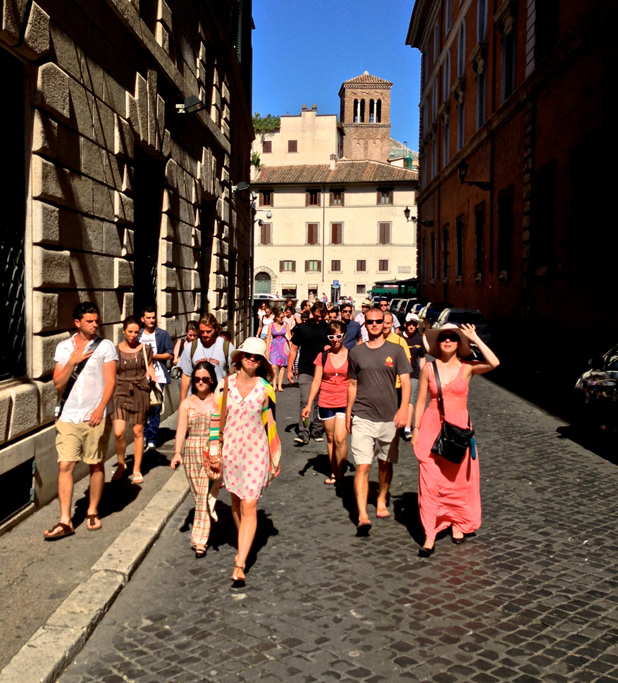 Participants are lodged in small groups (generally 4-6 people) in typical Italian houses in the historic center, where they eat/drink, shop, and interact with contemporary Romans. Modern Rome is an ideal place to live and study, offering all of the amenities and attractions of a major European capital with an international character, while retaining the charm and feel of a small city with a strong local color. It is well-connected to most major European (and some Italian) destinations via low-cost airlines operating out of its two international airports, as well as to the rest of Italy via the extensive network of the Italian National Railways—Florence and Naples are just 90 minutes away by rail, and the nearest beach is just 30 minutes away at Ostia Lido. The Summer Archaeological Field School-Study Session also offers the chance to meet, and make lasting friendships with, like-minded people representing a wide range of majors at both the undergraduate and postgraduate levels from all parts of the United States, and even the world. The 2015/6 programs included participants from the University of Southern California, California State University – Fresno, University of Pittsburgh – Greensburg, Gettysburg College, Rhodes College, Texas A&M University, Smith College, Dartmouth College, Boston University, and University of Vermont. They were joined by students from the University of Manitoba and Western University in Canada, University College London and the University of Leicester in the United Kingdom, Lund University in Sweden, and the University of Western Australia. Thanks to their training in Rome, many graduates of the Summer Archaeological Field School- Study Session have pursued, or are currently pursuing, graduate studies in Archaeology, Art History, or Classics/Classical Archaeology in rigorous programs around the United States and the United Kingdom, including Boston University, New York University, University of Kansas, University of Pennsylvania, University of Toronto, Brandeis University, Bryn Mawr College, University College London, Oxford University, and Durham University.